In the south of beautiful Canadian British Columbia is the pristine Lake Okanagan. The lake is long and narrow, running about 84 miles north to south and is up to 761 feet in depth. Long before white men arrived, the Native Americans feared and respected a lake monster they called N’ha-a-itk and steered their canoes clear of its lair (believed to be off Squally Point). Pictographs (see right) drawn on rocks in the area show the monster’s humps. “With the arrival of the first settlers, stories of a large unknown animal in Okanagan Lake continued. Concerns arose and many settlers took turns patrolling the lakeshore, musket in hand, to protect their families from an impending Ogopogo attack.” (Gaal, Arlene, In Search of Ogopogo, 2001, p. 13.) The name seems to have arisen in the 1920’s when a huge bone was supposedly found in Okanagan by a sea captain. This news sensation spawned a clever ditty that nicknamed the monster “Ogopogo” (see Mary Moon’s book The Okanagan Mystery.) Although there are a many credible Ogopogo pictures and even videos, the Okanagan monster is not accorded the same level of respect as Champ and Nessie. Dozens of local eye-witnesses and tourists attest to seeing large humps breaking the water or a broad-backed creature surfacing or traveling at high speed and leaving a large wake. To the left is a typical photo that was taken by Ed Fletcher back in 1976. Some observers claim to have seen the creature shooting water up like a fountain, similar to the ancient sea serpent reports. 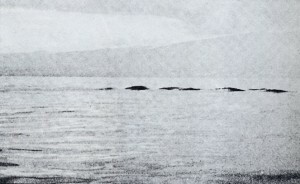 In July of 1989 a video was taken by Ken Chaplin showing the head of a large creature, an elongated body and a tail which slapped the surface like a beaver. In 2011 Genesis Park staff visited the area and did some investigating. We observed the “Ogopogo Phenomenon” from a boat just off Ellison Provincial Park. The lake had become very calm when all of the occupants of the boat plainly saw three dark humps in a line breaking the surface and then traveling off rapidly as they submerged again, leaving a huge wake. Most of the monster sightings occur when the water surface is calm. Perhaps this is because fish rise to feed at that time. If the creature is in pursuit of fish, this would also explain why the humps are often seen without the head being visible. In 1989 Ogopogo was given protection under the Canadian Wildlife Act. 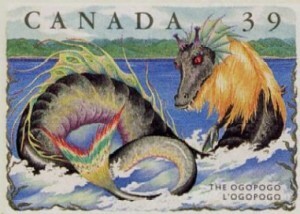 A colorful stamp of the monster was produced by the Canadian government. 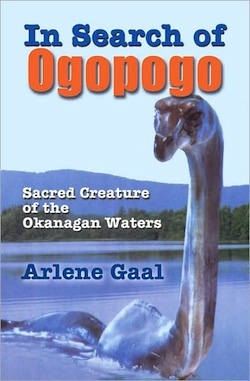 The picture (above right) gracing the front of Arlene Gaal’s definitive Ogopogo book was drawn by Caleb Doubtfire and is based upon reports from the few witnesses that have actually seen the creature’s head. Since some of the recorded observations involve the humps of the creature coming clean out of the water (like a hoop), it would seem like Ogopogo is closer in form to a serpent than a plesiosaur. Possibly the creature is closely related to the Cadborosaurus (see the page on Other “Swimming Dragons”) that had made its way up the Columbia River from the ocean and ended up at Lake Okanagan.